Day 2 of the €2,200 High Roller has kicked off at the same time as Day 1a of the Main Event and Unibet Poker ambassador Dara O’Kearney topped the counts of the 17 Day 1 survivors out of a field of 22 entries. The registration remained open and the field has since grown to 29 entries, of which 13 remain. Among those to bust on Day 2 thus far were 2018 World Series of Poker Europe Main Event champion Jack Sinclair, the Unibet Poker ambassadors David Lappin and Espen Uhlen Jorstad, as well as Adrian Nica, Jean-Serge Baril and Michael Mazilu. Another event that just restarted is the €330 Unibet Deepstack Open that featured a total of 155 entries, of which only 23 advanced to Day 2. 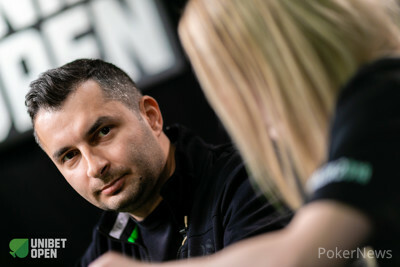 Unibet Poker ambassador and Unibet Open champion Dan Murariu busted soon after the action recommenced, while fellow ambassador Fredrik Bergmann is still in contention. Murariu was the first player in the money and collected €520 for his efforts, while the winner can look forward to a payday of €11,630.